Software, Biology, and Technology in the new millennium. Q. What kind of camera did you use? Q. How often did it take a shot? Q. Is that an AMD Opteron sticker on your dashboard? Q. If you had chosen a sound track, what would it have been? A. As if you had to ask... Truckin'! 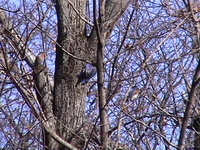 Last week I noticed a group of about 5 Eastern Bluebirds, accompanied by some other species, working their way around the tops of some dying Norway Maples on our property that are full of woodpecker holes. What was interesting was that multiple bluebirds were entering the holes at once (probably Red-bellied woodpeckers) - sometimes 4 at a time! Multiple males, and at least one female made up this group. Medium size (8 megs), streaming Quicktime video. Large size, non-streaming (20 megs - be patient) Quicktime video. I hope this doesn't become known as the "videos of flocking birds" blog. This next clip I filmed in late December is amazing. It shows a flock of hundreds (thousands?) of European Starlings all trying to pack into one small Eastern Redcedar across the street from my house. The problem is there are far more birds then can fit in the tree and at some points it starts to get pulled down. You have to see this to believe it! UPDATED - Remixed with music from Two Ton Boa. The original video is still online here. I am now hosting the remix on Revver. The remix is on Google Video here. By the way, Starlings are just about my least favorite bird, living up to their scientific came (Sturnus vulgaris). Non-native, and introduced into NYC's Central Park over 100 years ago by some Shakespeare freaks (seriously), they are now widespread across the U.S. and a major nuisance. On a positive note, if you ever manage to find yourself near a huge flock of them, the sounds they give off are absolutely amazing. Other than that... when it comes to non-native species, I hear they make great food for a pet snake. For real.